I'm not quite sure if that's chocolate or what on top. Thats definitly chocolate. You can see the last half of "Ghirardelli" printed on it. Yep. It was chocolate, and it was delicious. 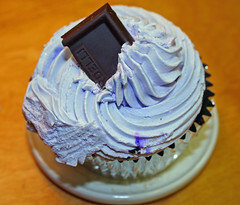 I thought I was getting a cold that day and eating this cupcake cured me ! Creative idea with the chocalate on top!